A diesel mechanic was severely injured as a result of an accident he suffered while replacing a hydraulic hose assembly on a front-end loader. He was found crushed between the lift arm assembly and the front axle. He was apparently replacing the hose which transported oil from the control valve to the cap-end of the cylinder. He was positioned in the only location from which the hose could be accessed. He had apparently taken some measures to make the area safe to work in. The machine operator had apparently reported that oil was leaking from the underside of the front frame assembly. The repair was scheduled, and the machine was transported to the workshop. The victim crawled under the machine and determined that the hydraulic hose connected to the cap-end of the rollback/dump cylinder was damaged, and needed to be replaced. To remove the hose, he needed to disconnect it from the port on the cylinder to which it was fastened with a swivel-type connector. He apparently tried to reach it from the underside of the machine, but it was inaccessible. He decided that the only way he could access it was to move the lift arm assembly out of the way. To do this, he started the engine and raised the bucket lift arm assembly into the air with the hydraulic control lever. He knew it was unsafe to work under an unsupported load, so he rolled the bucket forward until the cutting edge was almost perpendicular to the ground, and then lowered the bucket and lift-arm assembly until it settled on the ground. He then set the park-brake. Exactly what locks a hydraulic cylinder in position? Notice how the cylinder is constructed. It has a cylindrical tube which is capped on one end and has a rod protruding from the other end. Inside, it has a moveable piston which is connected to a rod. The other end of the rod is connected to the bucket. There are seals around the perimeter of the piston to prevent leakage across it. There are oil ports on both ends of the cylinder. The hoses (black) are connected to the cylinder ports. The opposite end of the hoses are connected to a control valve. When the control valve is in the neutral (hold) position, the oil ports are blocked. Since the oil (red) is incompressible, the piston is locked, and cannot move. Can the piston (rod) move if the pump is not running? Under normal operating conditions, the pump pushes the piston back and forth in the cylinder when the control valve is activated. However, the pump does not have to be operating for the piston to move. 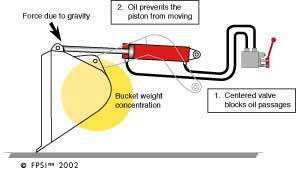 If the oil escapes from the cylinder, the piston can move by the force of gravity (the weight of the load) pushing or pulling the rod. It is important to note, that the victim in fact knew that when he removed the hose from the oil port, that the oil would no longer be a factor in supporting the weight of the lift-arm and bucket assembly. However, he figured that because the bucket cutting lip was firmly implanted on the ground, and that the park-brake was set, that neither the bucket nor the machine could or would move. He did not block the wheels. The victim crawled in under the lift-arm assembly, and disconnected the hose from the cap-end of the cylinder. He recalls having to screw the swivel connector all the way out with a wrench because it felt as though either there was pressure in the cylinder, or the threads on the connector were damaged. When it reached the few remaining threads on the connector, the hose end unexpectedly "blew off", and the lift-arm and bucket assembly came down crushing him between the lift-arm assembly and the front axle. If you own a front-end loader, sooner or later someone is going to have to work under the lift-arm assembly, so practice proactive safety - plan ahead. Have your safety department write a Job Safety Breakdown (JSB) for this task. Go over the JSA with your employees in your safety meetings. Don't reinvent the wheel. Contact the machine manufacturer, or refer to the manufacturers service and /or repair literature. You may find that it has already been done (It should be the responsibility of the manufacturer to provide proper safety information). Park the machine on a flat surface. 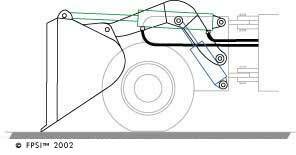 If the machine is articulated (steers by pivoting the front and rear frames), install the steering locking arm (if provided). Roll the bucket forward as far as it will go, and rest the cutting edge firmly on the ground. Put the control lever in the neutral "hold" position. Turn the engine-off and remove the key from the key-lock switch. 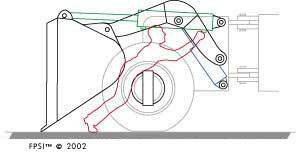 If the machine is equipped with steering and/or brake accumulators, gently rotate the *steering back and forth, until the steering pressure gauge reads zero pressure. Apply and release the brake pedal until the brake pressure gauges read zero pressure. This can usually be accomplished with the steering locking arm in place. Disconnect the battery lockout switch and lock and tag it. Place the key in the **lockout cabinet in the supervisor's office. Place chocks at the front and rear of all four wheels. If the manufacturer has supplied a cylinder lockout bar, install it on the cylinder rod. DO NOT climb under the lift-arm assembly to install it (follow the manufacturer's guidelines). If no special locking tools are provided, build a structure to support the lift arms. If it has to be fabricated, have an engineer review it to determine that it will support the weight of the lift arm and bucket assembly. WARNING Do not support it with an overhead crane and cable or chain. It must be supported from the underside. De-energize the hydraulic system and verify with a pressure gauge before disconnecting any hydraulic connectors. Wear safety glasses when working on or around a hydraulic system. WARNING Upon completion of the work, you may need to have the engine running to air-bleed the cylinder. DO NOT climb in under the lift-arm and bucket assembly while the engine is running. 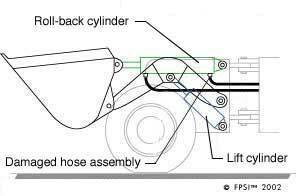 Install a closed-loop air-bleed system on the cylinder while the hoses are disconnected. The machine should be designed and built to facilitate safe air-bleeding. If a lift/lower cylinder or rollback/dump cylinder has been replaced, DO NOT start the engine and climb in under the lift-arm and bucket assembly to connect pins (extend cylinder rods to connect rod-end pins). This can be done with a portable hydraulic system. 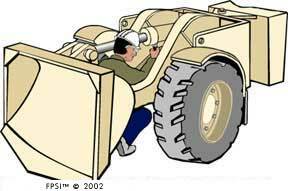 Upon completion of the work, start the engine, operate the hydraulic system, and check for leaks. 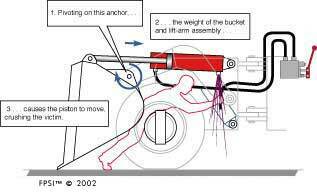 If there are leaks, and to facilitate tightening a connector, access must be made under the lift-arm and bucket assembly, repeat this entire lockout procedure - it may save your life! An anti-theft steering lock like a Club® can be used for a lockout device. Paint it luminous green, and lock it onto the steering wheel whenever the machine is locked out. Place its key and the machine's key in the lockout cabinet. Anyone entering the cab will know that the machine is undergoing service. It is a good idea to have a key cabinet on the wall in the supervisor's office. When a machine is locked out and undergoing service and/or repair, its key is hung in the cabinet for all to see, and it is tagged with the name of the person working on the machine, and what is being done.